The Smart Power Tower is the perfect desktop accessory for home or office. 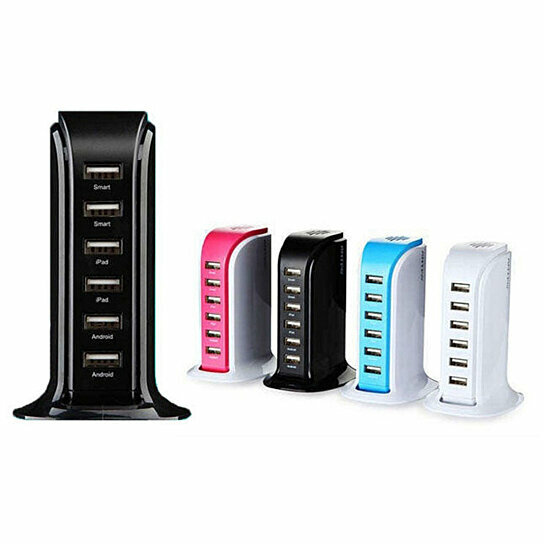 It features six (6) high-capacity (6 amp / 30 watt) USB ports that read the power requirements of your devices to intelligently provide the proper charge every time. The included 4ft extension cable plugs directly into a wall outlet. At roughly 4.5 inches high and 3 inches deep, it sits discreetly on your desk, nightstand or kitchen nook, ready to charge all of your Apple and Android devices.